Earlier this year a few friends and I bought vouchers to take a Cake Pop class. After some scheduling mishaps we finally took the class this past weekend. While the place was less than desirable we still had a fun time nonetheless and all learned how to make a new treat. Although, I think I’ll be tweaking the directions the instructor gave us when I attempt them on my own. 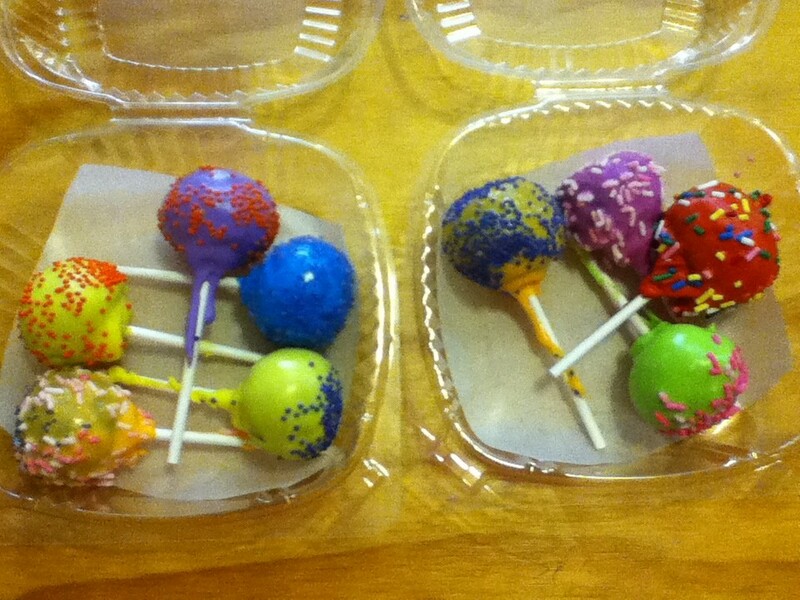 I ended up making a total of nine colorful cake pops. I stuck with the simple technique of dipping them in thinned-down dyed frosting and putting sprinkles on them as opposed to some of the fun creations my friends made. I’m sad to say that I actually didn’t try them after my friends tried some of their “casualty” pops – they fell off the stick before or after being dipped into the frosting – and they said that they were really sweet. While I do love my sweets anything overly sweet is just not my cup of tea. And considering the amount of frosting we used to bind the cake together in order to make the balls for the pops and then dipping them in frosting I was sure that they were a super sugar rush.